Critical reflection helps professionals to learn directly from their practice experience, so that they can improve their own work in an ongoing and flexible way - something essential in today's complex and changing organisations. It allows change to be managed in a way which enables individuals to preserve a sense of what is fundamentally important to them as professionals. It is particularly important as it can also help make sense of some fundamental issues, and so also has implications for how we live our lives. However, more systematic research on critical reflection is needed to help us understand what works best for professionals in different settings. This timely work explores how critical reflection is researched, evaluated and used as a research method itself, with the aim of improving how it is taught and practised in a rigorous and transferable way. Developing a more comprehensive and multi-disciplinary view of the current state of critical reflection and the research directions which need to be taken, the book is divided into four parts. It: - Provides an overview of different perspectives on critical reflection and stimulates dialogue between them - Establishes some common platforms from which to develop further research directions - Identifies the major issues in evaluating critical reflection teaching, and main methods for doing so - Contributes to social science methodological innovations by exploring how methods based on critical reflection can be used for researching professional practice - Contains contributions from academics who are internationally known and highly experienced in different aspects of critical reflection. 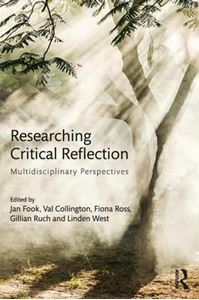 Researching Critical Reflection is an important reference for all students, practitioners, and researchers - including in the areas of education, management, health and social work - who engage with critical reflection to develop their practice.